Photo by LIZ VOS Sisters Mary Braun (left) and Lucy Maus have opened The Braun Maus on Albany’s Main Street. 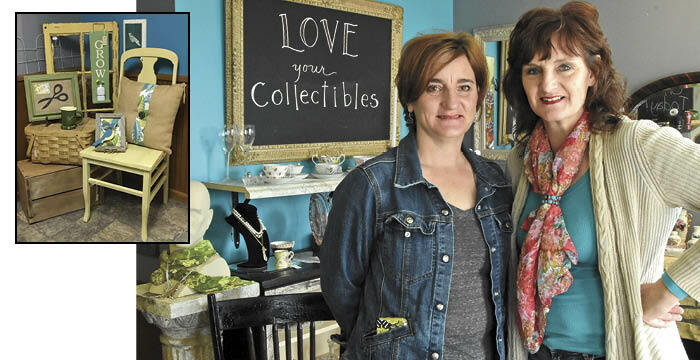 The business, which sells repurposed décor, antiques and more, is located in what has been The Hairitage Shoppe, which Lucy owned and operated for 30 years. Vintage and repurposed items are always being added to The Braun Maus. The longtime owner of the Hairitage Shoppe on Albany’s Main Street has said farewell to her regular customers and will now put her focus on a new joint venture with her sister, Mary Braun. The two will open The Braun Maus, a uniquely stocked shop filled with repurposed home decor, vintage items and furniture, many creatively made by Lucy and Mary. The location will be in the Hairitage Shoppe building, although new signage will soon be posted. “It’s a good time for me to make this change, but of course, any new venture is scary,” said Lucy, who officially gave her last haircut this week. For her, the work that saw her through so much was more than just a job; it was a relationship-building way of life. Despite the bitter sweetness of the transition, Lucy looks forward to what lies ahead. The Braun Maus – which is a combination of Mary and Lucy’s last names and a creative nod to the German heritage of the area – will give the sisters a chance to focus on their rustic and eclectic creativity. The Braun Maus is an occasional sale venue, meaning that there are no set business hours. Instead the shop will operate on occasional weekends (Thursday through Saturday) and sporadic days in between. This weekend, the store will be open May 11, 12 and 13. In regard to their product line, it is ever-changing as Lucy and Mary make old things new again. Repurposed décor and furniture along with a few new pieces they have found along the way combine to inspire a feeling of home. The hope is that The Braun Maus will be a place for customers to come to enjoy creativity or to find a unique accent piece for their home. The sisters, who grew up in Albany, hope their venture will serve dual purposes. One is to find success in owning their own business and two, is to help make and keep Albany a great destination point. Working together comes naturally to the sisters, who both agree that they each compliment each other in both style and ability, neither would care to try running such a business on their own and jumping in together was the best way to go about the change.